Marc Free’s Posi-tone Records is one of a handful of labels that churns out a significant number of quality albums on a regular basis. In the past couple of months the label has sent numerous new releases my way, so today I’m hitting you with a multi-part rundown of some of my favorites. I reviewed tenor saxophonist Ralph Bowen’s last album, Power Play, in Downbeat. In that review I compared Bowen’s sick chops and certain stylistic elements to Brecker, and thought his soprano approach was slightly reminiscent of Branford – comparisons which earned me a reaming out in a letter to the editor, even though it was a positive review. 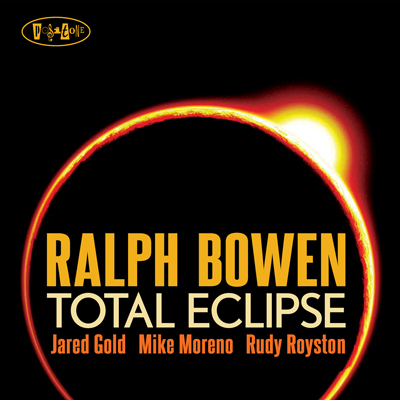 Bowen’s followup to that album is Total Eclipse, which features Posi-tone mainstay Jared Gold on organ, guitarist Mike Moreno, and drummer Rudy Royston. While I stand by my review of Power Play, I find Bowen’s playing on Total Eclipse (whether on tenor or soprano) to be extremely focused, sharp, swinging and reminding me of only one player: Ralph Bowen. Bowen penned all nine of the hour long album’s tracks. The title track opens the album in an easy, swinging fashion, with Bowen mixing up phrase lengths, rhythms and articulation and accent patterns – slinking, sliding, and winding his way through his solo. On his brief solo Gold mixes a slightly percussive phrases based on short note values with longer and more held out phrases, building upon Bowen’s statement nicely. “The Dowsing Rod” features Bowen on soprano and is one metrically tricky trip, having sections in 10, in 3 and in 4. Moreno sounds particularly good on this track, letting his slightly reverby sound and relaxed phrasing glide over Gold and Roysten. The penultimate cut, “Hip Check,” is a rowdy and rocking showcase for Bowen’s aggressive tenor. Royston holds things down with a slight backbeat and forward driving cymbals and Gold backs up Bowen’s solo by mixing up long sustained chords with quick jabs. Moreno’s solo, supported by a very active Royston, is for the most part quite understated, providing a nice contrast to Bowen’s fire. Overall Total Eclipse is an excellent outing that displays tight group playing, swinging charts containing a ton of craft and subtle hipness, and soloists who bring a firey intensity and creativity. If you dig other releases on Posi-tone, or are a Ralph Bowen fan, then definitely check this CD out. And if you’re not familiar with either, this album would be a great place to start.